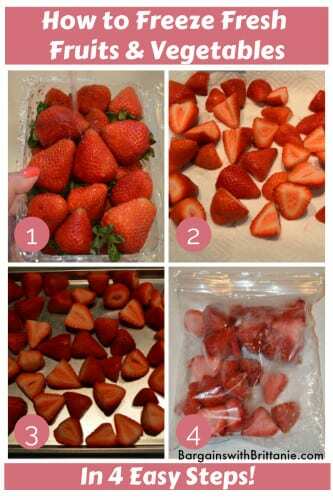 How to Freeze Fresh Fruit and Vegetables in 4 Easy Steps! Sometimes we see amazing deals on fresh produce and when we do it’s a great reason to stock up. The problem is fresh produce doesn’t stay fresh for very long so what can you do to prolong the freshness? 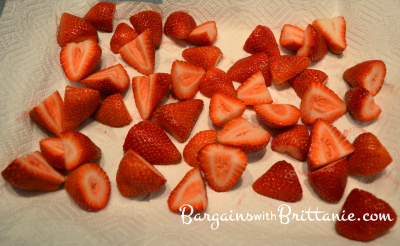 You can Freeze Fresh Fruits and Vegetables in 4 Easy Steps! Start by washing fruit thoroughly. Cut and sort your fruit and/or vegetables. You can combine different fruits and vegetables together or sort them individually. Sort them onto paper towels and allow them to dry for at least an hour prior to freezing. 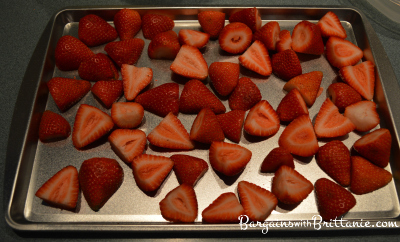 Once your fruits and vegetables are dry it’s time to lay them onto a cookie sheet. Tip: Make sure to remove the paper towels from underneath since they may stick once frozen. Spread out your fruits and vegetables evenly so they are not touching each other. Then place them into your freezer and allow them to freeze for an hour. Once your fruits and vegetables have been freezing for an hour (just long enough to where you can see a bit of frost on them) it’s time to take them out. 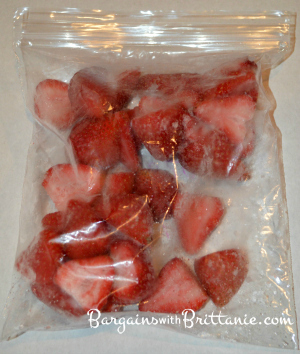 Simply place your fruits and vegetables into freezer baggies and there you have it! 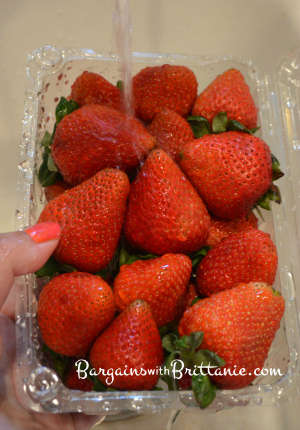 Fresh Fruits and Vegetables are now frozen for later use and you are preserving the freshness! Frozen Fruits and Vegetables can last 6 – 12 months when stored properly. To keep track of the date you can also write the date you placed your fruits and vegetables into the freezer right onto the baggies using permanent markers. Thank you for the detail instruction, now I know how to do it better. Thank you! We have strawberries and blueberries super cheap here in Fl. I will be doing this!